Harry Belafonte - "Sing Your Song"
Tonight I had the opportunity to go to a screening of the new Harry Belafonte documentary, "Sing Your Song," and it was a fantastic experience. The third session of Real-Phonic is scheduled for Thursday February 23rd - this time in Minneapolis! Gettin' my music nerd on at the Craig Finn in-studio. I know it's the hip thing to grumble about The Current these days... but I must admit, it's still one of my favorite stations and I think we're pretty lucky to have something like it in the Twin Cities. So when I was invited to go to an In-Studio last weekend for Craig Finn, I jumped at the opportunity. 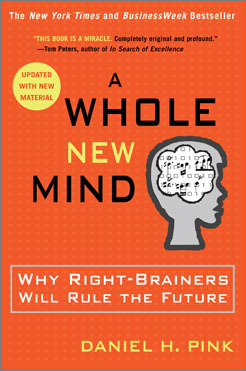 Read one of the most practical and enjoyable books I've read since reading Emotional Intelligence... A Whole New Mind. It was suggested reading for my summer class, but I brought it to the cabin to read over the weekend and couldn't put it down once I started. If I could, I would buy one for everybody on the board at Ae. Instead I'll have to pass around my copy. Artistic friends: read this book. It will boost your self esteem and give you practical advice on how to sell your creative skills. Analytic friends: read this book for ideas on how to encourage and stimulate your creative side. "Lawyers. Accountants. Computer programmers. That's what our parents encouraged us to become when we grew up. But Mom and Dad were wrong. The future belongs to a very different kind of person with a very different kind of mind. The era of "left brain" dominance, and the Information Age that it engendered, are giving way to a new world in which "right brain" qualities-inventiveness, empathy, meaning-predominate. That's the argument at the center of this provocative and original book, which uses the two sides of our brains as a metaphor for understanding the contours of our times. In this insightful and entertaining book, which has been translated into 18 languages, Daniel H. Pink offers a fresh look at what it takes to excel. A Whole New Mind reveals the six essential aptitudes on which professional success and personal fulfillment now depend, and includes a series of hands-on exercises culled from experts around the world to help readers sharpen the necessary abilities. This book will change not only how we see the world but how we experience it as well. "